New cannabis ads seek to stem the stoner cliché. Cannabis retailer MedMen has been fighting stereotypes in its advertising for months now, featuring everyone from white-collar professionals to grandmothers as weed lovers. 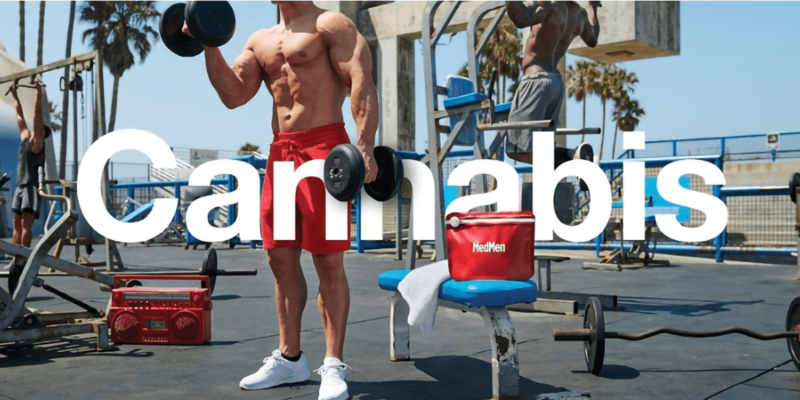 For a new $4 million campaign breaking Monday, the marketer leans into some Southern California cliches like sand and surf, a Rolls Royce in Beverly Hills, a shirtless weightlifter at Muscle Beach and a hipster with a guitar on the Sunset Strip. (Those are cliches for a reason, by the way). Each beautiful image has a single word written across it: “Cannabis.” The locations of MedMen’s eight Los Angeles-area dispensaries appear against a red background, and its sleek signature red shopping bag has a cameo in each photograph. The work, from the brand’s in-house creative team — and its most significant spending to date — intentionally doesn’t show faces this time around, in a departure from previous ads. The reason is so potential consumers “can see themselves in any of these stories,” said David Dancer, MedMen’s new CMO and a veteran of Teleflora, American Express and Charles Schwab. There’s an equally important message about place in these ads, which will appear on billboards, in print pubs and across digital and social. The outdoor ads can be found near stores on Robertson Boulevard in Beverly Hills, Abbot Kinney in Venice and the downtown L.A. arts district and feature such uniquely L.A. touches as the rainbow crosswalk on Santa Monica Boulevard in West Hollywood and the John Lautner-designed Goldstein House (a frequent movie and commercial set) as a backdrop. The startup, which is already a billion-dollar company often referred to as “the Apple Store of weed,” wanted to boost its media spending to reach a broader audience, Dancer said, though there are still plenty of restrictions on cannabis marketing even in states where recreational sales are legal. The amped-up broader marketing mix includes podcast integrations, brand ambassadors, live local events, wrapped cars, street murals and online editorial components (the second issue of the brand’s Ember magazine debuts with actor-director Lake Bell on the cover). Since the beginning of 2017 when California started allowing “adult-use” in addition to medical marijuana sales, the brand has debuted two separate campaigns. The first, “It’s Legal,” used close-ups of cannabis consumers whose uses veer more toward relaxation, pain relief and wellness and less to the stereotypical Cheech and Chong-style overindulgence. The effort included a building wrap at the famous Whisky a Go Go nightclub on the Sunset Strip. A follow-up that premiered on 4/20, called “Forget Stoner,” again batted down the myth that only Snoop Dogg and characters in wacky comedies use marijuana. The ads featured triathletes, physicists, nurses, teachers and entrepreneurs. MedMen, with operations in California, New York and Nevada, plans to redo the “Cannabis” campaign with picturesque Las Vegas sites for the opening this fall of its third location there. The new shop will be near the fabled Strip.